This center offers a variety of office space solutions on very flexible terms. Many options are available, and this modern building is in excellent condition. This is a strategic location, close to retail, Government buildings, hospital and various other amenities. This is a standout location, in a growing commercial and community focal point of Cherry Hill. 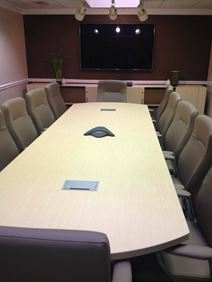 This third-floor center overlooks the heart of Garden State Park, and offers a range of workspace solutions. Philadelphia offers diverse commercial opportunities, including global trade connections throughout the district. The area's transport infrastructure is also very convenient and allows easy access to the center and the wider region. This serviced office provides clients with an impressive business setting, with excellent modern facilities and friendly staff. The center boasts a convenient location easily accessible from both New York and Philadelphia. Reception, word processing, administrative and accounting support are available at a fraction of the cost of a full-time employee, and are billed only when used, not built in to a higher monthly rental rate.